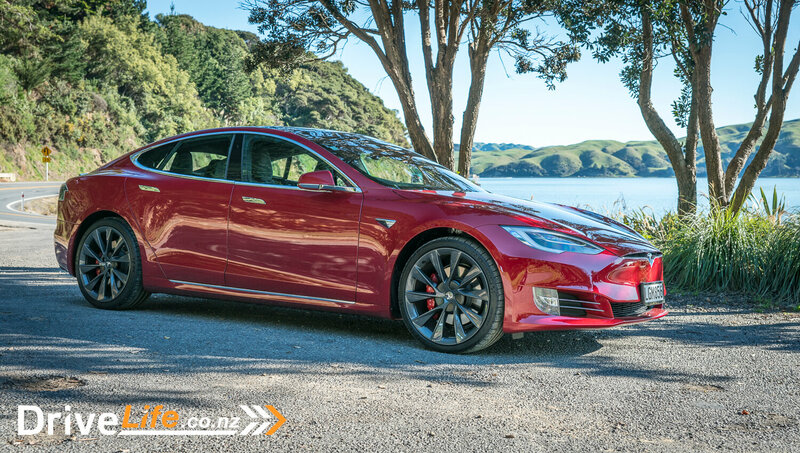 Our time has finally come to review the Tesla Model S P100D. This has been extremely long awaited, so much so that we were worried that we may not have much to review due to all the publicity and YouTube videos across the internet. But that didn’t discourage us from taking the P100D for a week to see what all the hype was about. 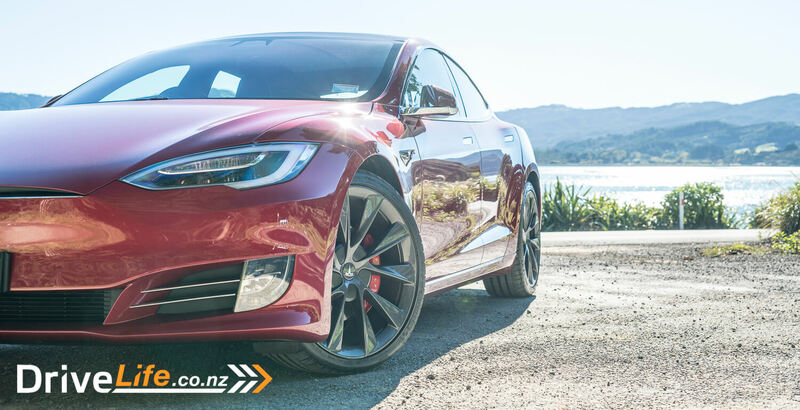 The model S is available in New Zealand in three model variants: the 75D which starts at $124,795, the 100D which starts at $155,045 and the P100D which starts at $214,645. All three models from the outside look exactly the same, the only difference is the badge on the back. The 75D comes with dual electric motor and a 75kWh battery, which offers a range of up to 490km. It has a 4.4-second 0 to 100 km/h and a top speed of 225km/h. The 100D comes with dual electric motor and a 100kWh battery, which offers a range of up to 632 km. It has a 4.3-second 0 to 100 km/h and a top speed of 250km/h. The P100D also comes with dual electric motors and a 100kWh battery, which offers a range of up to 613 km. It has a 2.7-second 0 to 100 km/h and a top speed of 250km/h. The range of options is also the same across the range. There are seven paint colours, with Solid Black a no-cost option. Midnight Silver, Obsidian Black, Deep Blue, Silver are at $1500 each. Pearl White and Red are both $2300 options. The roof comes as standard with a solid glass roof. This can be upgraded to a have a panoramic sunroof for $3100. For the wheels you have four options, with 19” silver wheels are standard. They can be upgraded to 19” Sonic Carbon Slipstream Wheels for $2300, or the 21” Sonic Carbon Twin Turbine Wheels for $6900. 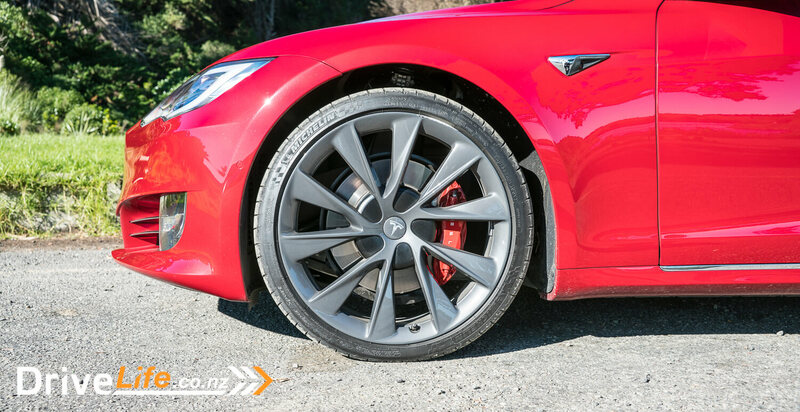 Finally and exclusive to the P100D, you can option it with the 21” Black Arachnid Wheels for $6900. The interior has six options, the standard one being the black textile interior. In the 75D and 100D this can be optioned with carbon fibre inlay for $400, while it is a no-cost option on the P100D. The 75D and 100D have four other interiors to choose from: White Premium, Black Premium, Black Premium/ Light Headliner and Cream Premium. Each of these options is $5100. On the P100D you have the choice of Black Premium and White Premium as no-cost options. Each variant comes as standard with the premium upgrades package. 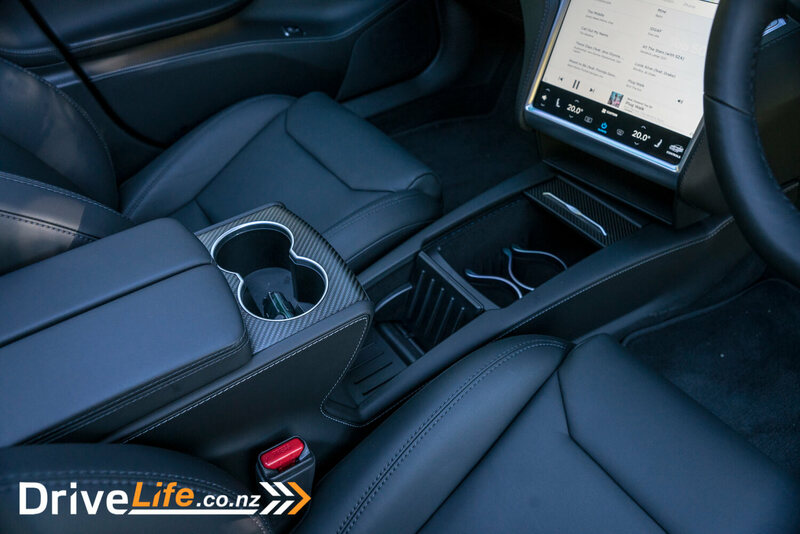 This consists of medical-grade HEPA air filtration system, premium audio system and sub-zero weather features including a heated steering wheel, wiper blade defrosters and washer nozzle heaters. The last four options are the Enhanced Autopilot ($7,700), Full Self-Driving Capability ($4600) and rear-facing third row ($6100); and, exclusive to the P100D, a carbon fibre spoiler as a no-cost option. 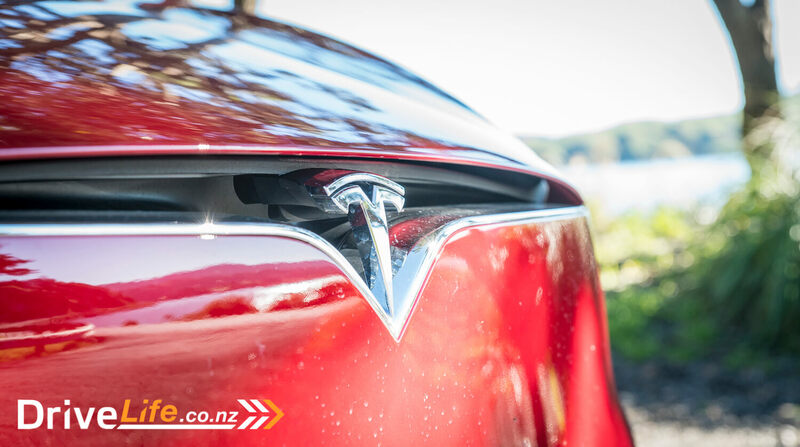 As Tesla does not have a dealer in Wellington, we arranged to meet the Tesla representative at the InterContinental Hotel. As I walked up to the hotel, the Model S P100D stood out in bright red. It was noticeably long and sleek compared to the vehicles around it. You could tell it was different, but you could not tell why. Overall our review car was a pretty good looking bit of kit and I couldn’t wait to jump in and start our review. But before this happened, the Tesla representative took me on a comprehensive guided tour of the vehicle and its features. Once completed, we said our goodbye and it was time to hit the road and begin our review. When you jump in the Model S the first thing you are confronted with is the massive 17” vertical touchscreen. It’s rather eye catching at first—or eye distracting, as there is so much info on there. But more about that later. The interior is nice and clean, while also being rather sparse. There are no buttons; or rather, I should say, it does not have the usual buttons that decorate most dashboards. There were two that I could find, one either side of the main display screen. One was for the hazard lights and the other was to open the glove compartment. The rest of the dash was made up of carbon fibre inlays, some air vents and a leather bound frame. It was nice, but not exactly luxury, or what I have come to know as luxury. 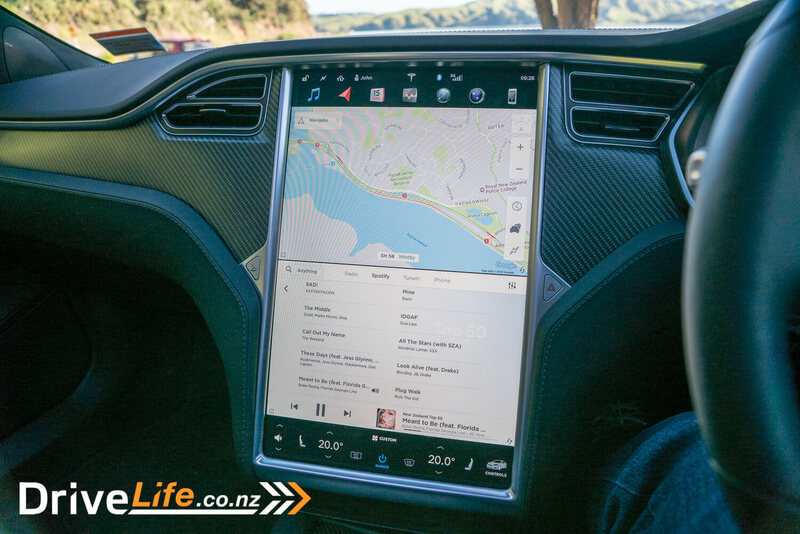 It felt no different to any of the $50k+ cars we review, with the major difference being the massive touch screen. From a design point of view, it really did not integrate well. The seats were pretty good, well made and shaped with great support. I found it easy to get comfy in the P100D, making for an enjoyable week behind the wheel. Both front seats only had basic adjustments settings, seat forward and back, seat up and down, seat backrest forward and back and lumbar support. The head rest could also be adjusted manually. No leg rest adjustment which is great for taller people and common in most luxury cars these days. Overall the seats were good. The space in the back was ok in length, but not great for a tall person. The floor was higher due to the space the batteries took up in the floor, which made people in the back feel a bit cramped, especially for taller people and I found it tight when sitting in the back. However, I found getting in and out of the back easier than the front, as the front windscreen is raked more steeply than normal, making it easy for tall people to bang their heads if they don’t duck. This reminded me more of sports cars or supercars which have similarly raked windscreens. The cabin itself had a decent amount of storage available. Under the main screen there were two cubbies, a large one with dividers for extra cup holders and another which allows access to the USB ports for phone charging. This second one, when open, can double as a cradle for your phone with the right cable or attachments. I assume this would be a Tesla accessory sold separately, however I could not find any info on their site. The armrest also had two cup holders and another storage area under the armrest itself. I was surprised to see that the doors did not have any storage cubbies at all, front or back. 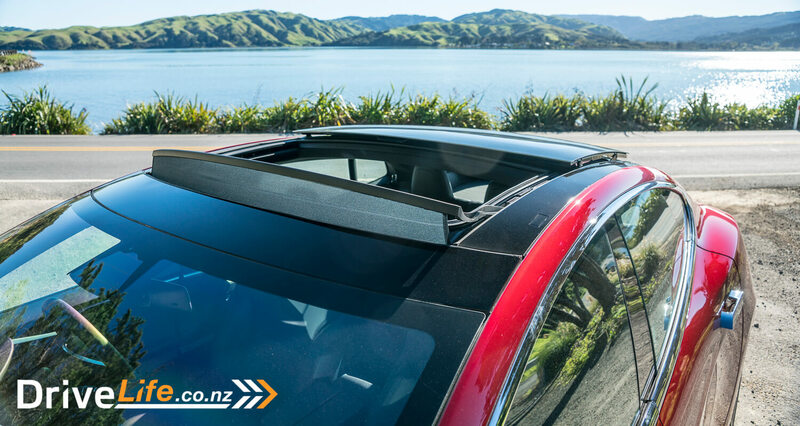 The roof in the P100D was optioned with the sunroof. Regardless of where you sat, the entire roof was glass. This made the cabin very open and feel spacious. There was a bar in the middle of the roof which split the solid roof of the rear to the sunroof in the front. Much like any other panoramic sunroof, it tilted up, slid back, everything you would expect of it. I would consider this a “must have”, but I have always been partial to an opening sunroof in cars. The boot or boots provided very a healthy combined capacity of 894 litres. 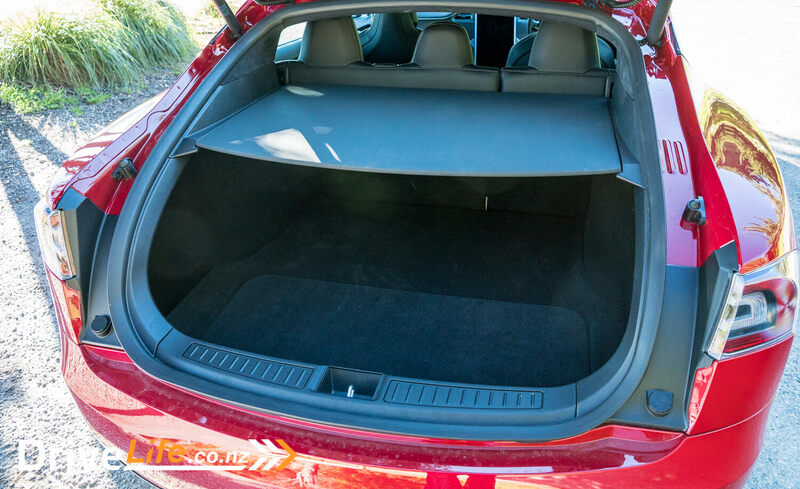 Having no engine in the front allows for 150 litres in the front boot on top of the already generous 744 litres in the rear, which, for a sedan, is enormous and probably the largest in its class. As far as the interior goes, that’s it. The only two things left to cover are the driver display and the central touchscreen. So back we go to the central touchscreen, and what it’s all about. The screen itself is split into three sections: the top menu buttons, the display screen applications and climate control menu at the bottom. The two top and bottom menus stay static, while the centre section changes from either a full screen of info or is split in half with a top and bottom showing different applications. The top menu consists of (from left to right) Audio, Navigation, Calendar, Reports, Internet, Cameras and Phone. Audio allows you access to the radio, music from your phone and Spotify. And thanks to the unlimited internet provided by Tesla, you can stream Spotify for free all the time. I used this all the time, and it was awesome. Navigation is simple – they use Google Maps – thanks again to the internet connection. This is where you can take advantage of the split screen, which can allow you to have the navigation open while still having access to the audio menus. The calendar was not tested as we didn’t have any entries. Reports allowed you access to vehicle monitoring info. This tracked the vehicle’s efficiency while it was driven, or how the power had been used, economically or excessively. They were very detailed and one could lose a lot of time looking over them to make the most of the power available in the car. The camera allowed you to see out the rear view camera, which could be done while the car was moving too, which was odd. And last but not least was the phone, which gave access to settings for syncing your phone or Bluetooth devices. At the bottom right hand corner of the screen there was a button called Controls. This gave you access to all of the vehicle’s selectable features. This is where most of the buttons that might be found on a regular dash are stored away. In here there are 6 main menus; Sunroof, Suspension, Driving, Cold Weather, Trips, Displays, E-Brake & Power Off. The sunroof menu was pretty cool, as you could by touch slide back on the image of the car and open the sunroof. This is the sort of cool forward thinking I like from Tesla. Not using what everyone else does, but still offering an easy option. Suspension allowed you to set the vehicle’s height into 5 settings, Low, Standard, High, Very High and Jack. Driving gave you access to a range of acceleration, steering, traction control and regenerative braking options. This is also where you can select the famous Ludicrous mode for maximum battery power and the eye watering 2.7 second 0-100 km/h. Cold Weather has an array of heated seats, heated wipers and heated steering wheel options. Trip had more information about the current and previous trips you had taken. Display controls the display itself, with brightness and day and night modes. Clean mode which turned the screen off so you can wipe all those fingerprints off. E-Brake & Power Off had options for the hand brake and to power off the entire vehicle. The driver’s dash was also another impressive display. This panel was divided into three sections of information. The Map information; on the left, the car’s state or position on the road in the middle and the vehicle’s info on the right. The map was nicely integrated into the side of the display and it was super easy to use when requiring navigation. The central section displays the car’s state or position, so if the door is open it would display that it’s open. When driving it would display a road with the road lines either side and your position on the road. If you drove over the line, the car would display that it’s over the line. It also showed other vehicles around you, which was rather impressive, picking up cars that were over 50m away from the front of the car. On the right you had the driver’s information panel, which could cycle through a range of options from average power use to range etc. The one thing that I really liked from the driver’s dash, was the display when parking. Many other cars with sensors around it, displaying if you’re close to something or not. However it went one better, instead of just beeping louder, it also displayed a measurement of how far you were away from the object, which I thought was great, as you’re not always sure with the sensors how far you have left between you and an object. The menus and options are really endless, and I could carry on for another few hundred words. All in all the tech was by far the most impressive I have encountered in any car on the market. Driving this Tesla was weird. Well weird if you are not used to an electric vehicle. It was very quiet, and just wafted along with a strange eeriness about it. I was impressed already, as I could hardly tell if the car was on or not. The only thing that confirmed it, was the fact I was travelling down the street. This was partly thanks to the massive battery in the floor which also acted as a large dense sound deadening insulation. Even normal tyre noise was less than you would typically expect. On the move the Tesla is no harder or more difficult to drive than any other typical car on the road. The only thing you might find you need to get used to is the regenerative braking. Unlike a the BMW i3, the Tesla’s regen braking is not as strong, so you do still need to apply the brakes when coming to a stop, where other electric cars take full advantage of the energy created from braking and are more aggressive. I didn’t mind it, but would have prefered if the regen braking was stronger and could not find any options to change this. It was obvious that this was a heavy car, you could tell by how the car moved in the corners. This had an unexpected effect on the car’s feel. Due to the heavy batteries’ low position in the car, it created a low centre of gravity. This gave the car a very planted and almost sports car-like feel when driving around. When you went into a corner, there was very little body roll. The disappointing side of this is that it was the only part that felt like a sports car. 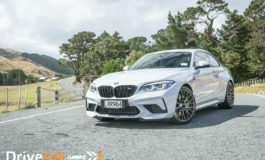 There was not much feel from the rest of the car, like you would get with many sports or performance cars. 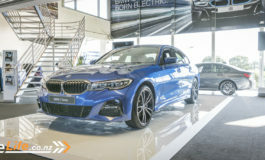 Whether it was due to the heavy sound deadening or the fact that everything was electric – even the steering – there was just not a lot of driver feedback or feel when behind the wheel. As a daily cruiser, I found the P100D was very comfortable, relaxing to drive and easy to use. I often get asked what are the cars like to drive, and sometimes it’s hard to remember. The P100D was one of these undramatic vehicles, except for ludicrous mode of course. It was able to do all the normal tasks you want a car to do well and effortlessly. It’s clear as day why many people are keen to make the move from combustion engines to fully electric. While driving at night I always found the central screen too bright, even in its auto brightness setting and night mode. This may have just been the size of the screen, but the glow from it was too much, and I had to manually lower it down anytime I was driving at night. And while we are on the subject of night driving, what’s the deal with the rear view mirrors? This car didn’t seem to have any auto or manually dipping mirrors, not the side and not the main rear view mirror. On their site, it lists that it has both, but I they did not seem to work and could not get them working during my test. The time had come to test the famous Ludicrous mode. As we don’t have access to a closed runway or closed of streets I waited till late one night and found myself a wide empty desolate industrial street. I stopped the car, made sure I was strapped in and was ready to give it everything. I had selected Ludicrous mode earlier as I had heard that it helps to give time for the batteries to heat up. Not sure if this is true or not, but it can’t hurt. And in 3… 2…. 1 I stomped my foot all the way the floor. And 2.7 seconds later I was at 100 km/h and I got straight on the brake and stopped. Holy mother of God, that was mental fast, my heart was pounding. I had been in many fast cars, but that was so far the fasted I had probably every accelerated. Formula 1 cars can accelerate at these sorts of speeds. My hands were shaking a bit, as it was hard to comprehend how fast that really was. In the space of time it takes most of us to unlock our phones, this car had gone from stand still to 100km/h. It’s mental, or as Tesla say, it’s Ludicrous. I will admit it was fun, and very impressive. However I would be somewhat worried about giving many of our day to day drivers this kind of power. Many of them already struggle with the average cars they already have. 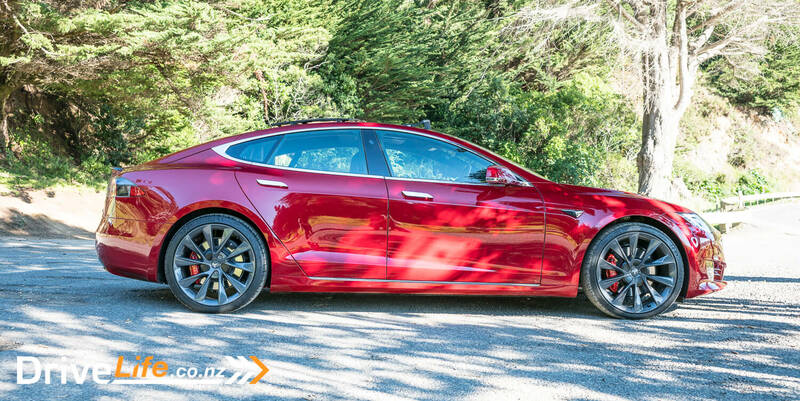 So what does the Tesla Model S compete with? Many say it competes with everything, for the most part they are right. However it’s not all apples to apples, bit more like apples and oranges. The Tesla is an impressive car, but it’s not a luxury performance car. Yes it’s fast, but that’s just one aspect of performance. Is it luxurious when compared to equally priced models? Not really. The Tesla comes off a bit cheap and lacking in plush features, so it’s hard to say where it really sits. And as it’s the only EV currently available on the market in this price bracket all we can do is show you what else you can get for that sort of money. Is the P100D the untamed unicorn that the internet hype has built? No, not really, and here is the hard truth why. It also looks exactly the same, in every way, as the 75D which is $88,150 cheaper. The value and quality is really not visible for the price they are asking of $214,645. 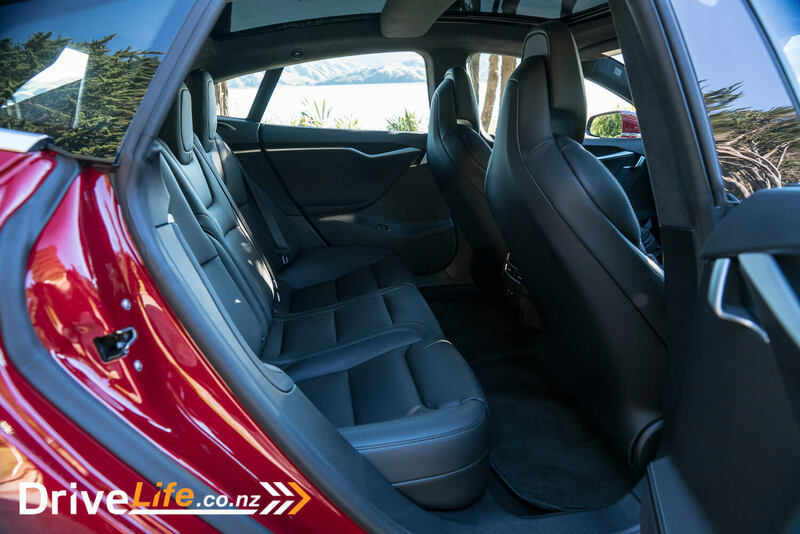 Not one person who sat in the P100D could believe its price tag. And the options push the price up again, many of which are standard on other vehicles in that price bracket. 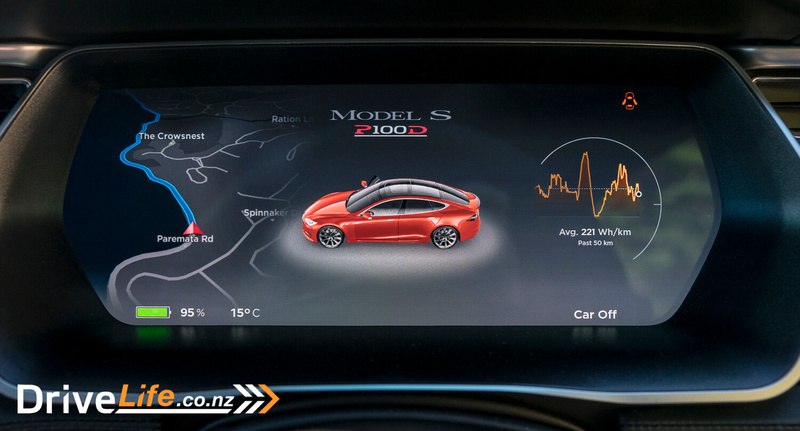 Most people hang on to the fact that Tesla have the ability to outrun a supercar to 100km/h. Yeah sure that’s great, but how often would you actually use that feature in the day to day? It’s tech is super impressive, and its powertrain will definitely be a part of the future of automotive technology. But that’s kind of where the impressive stuff ends. I am not hating on the brand. 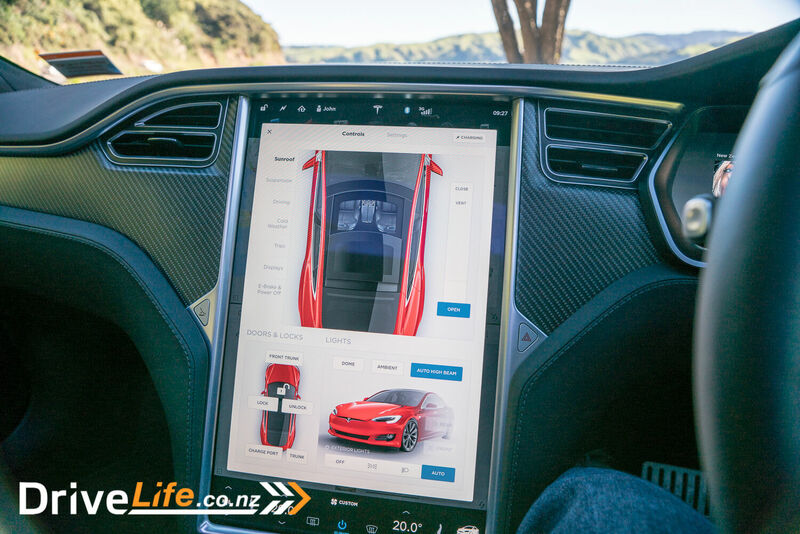 I fully believe that focusing on the tech was the intent of Tesla Motors founder, Elon Musk. His plan was not to take on the bigger established brands and push every last one of them out of the industry. No, his plan was to divert the course of automotive development. Which he has, with each and every Tesla model and the growing cry from consumers for more EV vehicles. 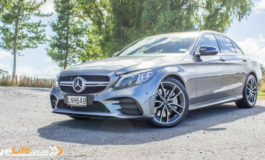 If this car was $100k cheaper it would probably be the go-to car for many people looking for a midsize or large sedan. This is my biggest issue with it. Yes the tech might be expensive, but if you label your car as high end luxury, it needs to stand side by side with what the rest of the market offers at that price. And right now, it only stands above in regards to its tech. So what does this all mean? This car, right now, can only be justified by people with very deep pockets or the must have early adopters. And both of them would buy it just for the sake of having the hype built branded Tesla, and its performance figures. No one is buying these to have the latest luxury car, or to save the planet, and if they think they are, they should look at how battery material is mined. For the rest of us, the P100D is still too far away. There are plenty of other vehicles out there for much less, if the goal is to drive a fully EV vehicle. The tech is right on point, but the packaging lacks a lot in quality and value when compared to other products in that price range, it just doesn’t add up for me. Compare it to a Lambourghini which has trunk space for a golf club, sits 2, doesn’t accelerate that fast, but costs twice as much, as well as sticks it to Mother Earth. Yikes! The problem might also be that prices have to align with Aus where insitead of electric car incentives like in other ciivilised countries they slam on an extra 30K “luxury” tax and duty. 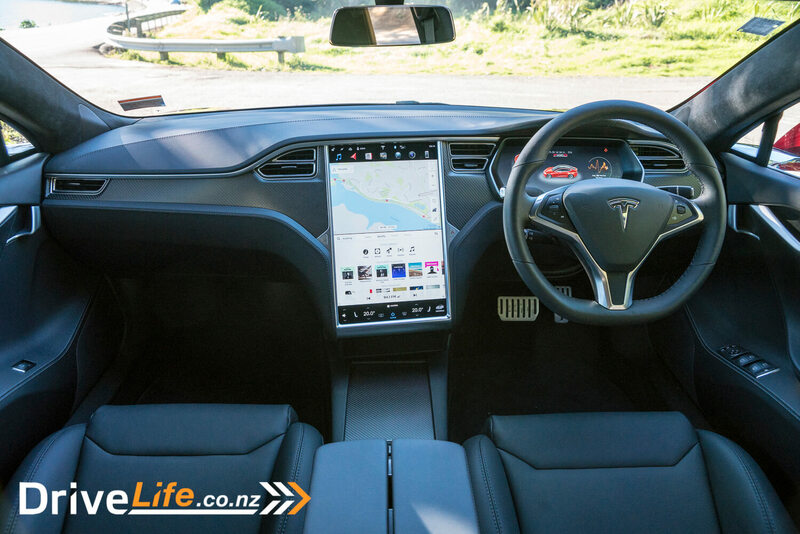 A big bummer IMO is that for the topmost eye-watering price one loses an attractive cream/wood interior option, and the panaromic sunroof reviewed here is no longer available due to “streamlining” of production (https://electrek.co/2018/11/10/tesla-model-s-model-x-option-price-changes); consequently, neither is a roof rack option, which can’t be fitted to solid glass roof, so won’t be able to flash your Model S on NZ ski fields. No tow bar either. Dmitry, you could buy and aftermarket tow bar for a Model S from the USA as well as the electronics for lights. It would be useful for a bike rack or ski rack or a small and light trailer. See https://torkliftcentral.com/2012-2016-tesla-model-s-ecohitch-stealth and you will also find they sell a wiring harness. 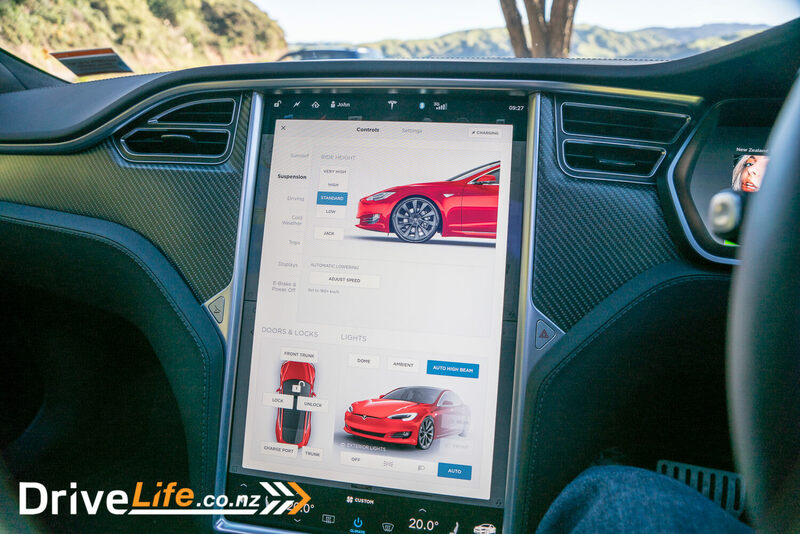 Naturally, this is not recommended by Tesla for the Model S and may invalidate your warranty.